What’s “Old” When It Comes to an AC? The average service life of a central air conditioner for a home is 10 to 15 years. If a system is older than 15 years, then any repair is a repair too many—we recommend installing a new system. If your air conditioner falls in the 10 to 15 range, then look to these tips below for help with it. Never miss maintenance: This is the essential step for ensuring an air conditioner doesn’t suffer from a major efficiency crash or abruptly die on you on a scorcher of a day. Maintenance also keeps away repair problems. Basically, regular maintenance is how you slow down the air conditioner from aging. Please have professional maintenance done each spring—it’s the best way to get the most return on your investment in cooling. Change the filter more often: We advise changing the AC’s filter every three months to help the system work its best. But for an air conditioner more than 10 years old, we recommend switching to a more frequent schedule of monthly changes. You’ll keep more strain off the system and help avoid any dust and debris getting inside. Move immediately when you think there’s a malfunction: Call repair experts as soon as you notice anything wrong with the AC. For an older system, delays can mean the difference in something that can be fixed and something requiring replacing the entire system. Give it a break with the thermostat: Saving energy with higher thermostat settings is a good idea no matter how old the air conditioner is. 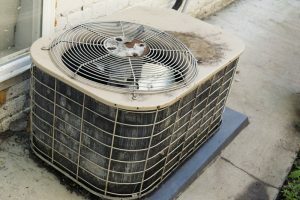 When an AC gets up in years, it becomes even more important not to push it too hard by lowering settings far below 70°F. In fact, if you can keep it at 78°F during the day, you can significantly reduce system stress. This is the reality: your AC that’s older than 10 years may not be worth these efforts. If the system is costing more to run than it once did or needs repairs that cost either $500 a year or half the cost of putting in a new one, then put in a new one. We doubt you’re sentimental about your air conditioner, so when our technicians inspect the system and recommend a replacement, it’s definitely the right course. Bob Mims Heating & Air Conditioning: Serving Staten Island’s Heating and A/C needs since 1955. Arrange service for your cooling system today.